Kennesaw, Ga. – In April 2018, Gallus and Heidelberg announced the completion of their full integration in North America. To highlight their commitment to the label industry and to show the combined strength of both companies with their aligned product portfolios, Gallus and Heidelberg will join together to exhibit in Booth 6150 at Labelexpo Americas 2018, which will take place from September 25-27, 2018 at Donald E. Stephens Convention Center in Rosemont, Illinois. Additionally, Gallus’s new Smartfire digital label printing system will be unveiled to the North American market, and Heidelberg’s Omnifire 250 4D inkjet digital printer will be available for demonstration at the largest event for the label and package printing industry in the Americas. Respective market leaders in narrow-web and sheetfed offset printing, Gallus and Heidelberg now offer a complete print shop solution for label printers with reliable equipment, parts, service and consumables support – all from a single source. Gallus’s vast portfolio includes the Labelmaster, the most cost-effective system in the industry. From the economical basic model to the fully equipped version, the Labelmaster is redefining conventional flexographic label printing; its modular design enables customers to configure the press to the needs of their business. On the digital side, Gallus’s Labelfire, an advanced hybrid inkjet system that was developed with Heidelberg and Fujifilm, is setting the standard for UV inkjet image quality with the lowest cost of production in its class. For high quality conventional flexo label production, customers can also rely on the Gallus ECS 340 for cost-effective label production and Gallus RCS 340, an extensively automated system for high-output label production. On the offset side, Heidelberg has, for years, been a supplier to the label industry – most notably with their flagship press, the Speedmaster XL 106 with 41” sheet size, ability to print 18,000 sheets per hour, and optional UV, LE UV, and LED curing systems, which enable it to print on a variety of substrates, including synthetics. Customers can now also turn to Heidelberg’s Primefire 106, the first commercially available industrial inkjet digital printing system in the 70 x 100 (40”) format. Printed labels can be finished with the Heidelberg portfolio, which includes POLAR cutters and a variety of die cutters from Masterwork. All Gallus-Heidelberg customers benefit from the specialist industry expertise of both companies along with Heidelberg’s established service network and extensive parts availability. Visitors to Labelexpo Americas can learn about all of these comprehensive solutions in the Gallus-Heidelberg booth. Gallus Smartfire: Easy, Simple, Smart. Affordable Inkjet Label Printing is Now Possible. Gallus is expanding their product portfolio with the Smartfire, a new, fully-featured, value offering for digital narrow-web label printing that is focused on ultra-short runs. 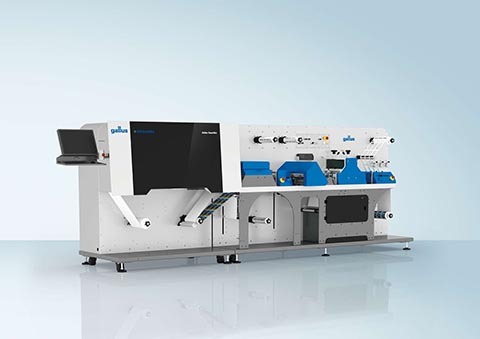 The Smartfire premiered at Gallus Innovation Days in late June and will make its North American debut in the Gallus-Heidelberg booth at Labelexpo Americas. The Memjet water-based inks and print heads mean that labels produced by the Smartfire are eco-friendly, with a minimal ecological footprint. Virtually “plug and play,” the Smartfire uses an ordinary power outlet, needs no exhaust equipment, is extremely compact, and does not emit VOCs (Volatile Organic Compounds), which makes it the perfect press for any work environment. “The name says it all, the Smartfire is absolutely easy to operate via a self-explanatory touch panel,” says Ring. With this digital press, limited prepress skills are needed to create professional CMYK 4-color inkjet labels. Addressing the shortfall of other offerings in this space, a finishing unit is integrated into the press, where labels are laminated and cut, which means the Smartfire delivers finished die cut labels in one pass, ready for shipping. Also available for demonstration in Booth 6150 at Labelexpo Americas will be the Omnifire 250 – Heidelberg’s “4D Printer,” which combines advanced Inkjet technology with high-precision robotics. The Omnifire 250 can personalize and customize most three-dimensional products. From a wine bottle to tumbler and beyond, the Omnifire gives customers the ability to change products over within seconds — providing shorter delivery times with on-demand printing. The Omnifire, Smartfire, and Gallus-Heidelberg integration will be discussed in full at their joint press conference, which will be held at 12:00PM Central on September 25, 2018 at the Donald E. Stephens Convention Center. In addition to the Gallus-Heidelberg booth, CERM, a software solution provider for narrow web printers and part of the Heidelberg group, will be exhibiting at Labelexpo Americas in Booth 6580.